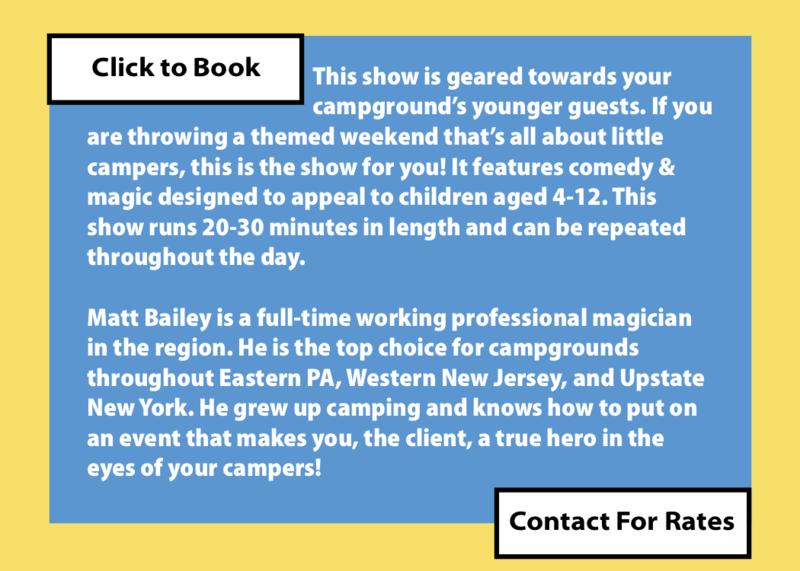 You want to bring comedy magic to your campground guests? Awesome! ​What age range will enjoy your show? Is it just for the kids? My campground show is specifically designed to appeal to all ages. This is not a ‘kids magic show.’ It is a true family affair. 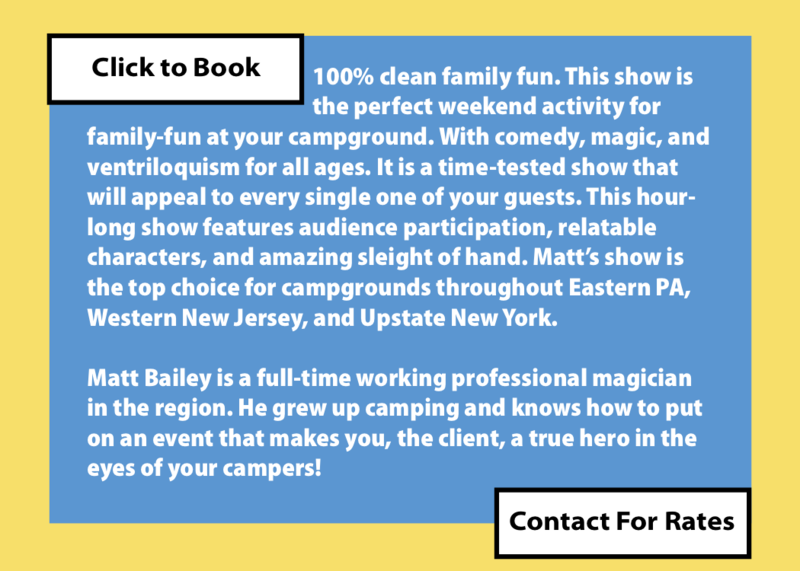 What makes your show campground show different from other magicians? I grew up camping with my family. More specifically, I grew up camping (in a camper) with my grandmother and my grandfather. I count those summer days among the best memories of my childhood. I continued to camp with them well into middle and early high school, as I was developing myself as a magician. I saw that campgrounds are truly some of the most diverse audiences anywhere. From retirees enjoying a woodland escape to families getting away for the holiday weekend, I saw first-hand that entertainment for campground audiences needs to appeal to everybody. Performing at campgrounds in the summer has become a tradition I look forward to every year. We are putting on an event just for the children at our campsite. Can we still hire you? Absolutely! Contact me directly and we can discuss my children’s show. ‘MagiQuist’ is a hybrid of the words ‘Magician’ and ‘Ventriloquist.’ I came up with this word to describe the fact that my show offers both comedy magic and ventriloquism. However, magic-only shows are available. I only need one electrical outlet close to the stage or performance area. If I am performing in a pavilion, the power should be turned on prior to my arrival at your campground so I can set up quickly and not delay the start to the show. How much space do you need? Inside or outside? Is a pavilion OK? I usually request an 8’ x 8’ space to set up my equipment. All guests (including children) should be seated in chairs or at tables. Inside is usually the perfect place for a magic show! If you have an activities hall or other open indoor space, the environment is better controlled, and everyone can stay focused on all our fun with minimal distraction from wind, heat, and other campers. That said, I understand most places only have a pavilion for their activities. This is perfectly fine, as long as the weather does not become a safety hazard for your guests. If there is any question about the weather on the day of your show, please see my cancelation policy below. Myself and my assistant will arrive at the campground about 1 hour before the show starts. This is so we can set up the show, sound system, and greet your guests. It takes approximately 20 minutes to pack up and exit the property. Absolutely! I encourage photo-taking and shooting video, and I ask that you send them to me or tag our page in anything you post. It’s always great to capture priceless memories, especially while escaping to the campground! Performances may be canceled up to 14 days before the performance date without penalty. If the show is cancelled with less than two weeks' notice, you will be responsible for payment of the fee in full. However, this may be applied to a future date within the same camping season. Please note that any risk of bad weather for outdoor/pavilion events is borne entirely by the client and payment is due in full, though it may be applied to a later show within the same camping season. If the show is in a pavilion, and the weather becomes bad enough that the pavilion is no longer adequate cover, payment is still due in full and applicable to a future show that season. This is for the safety of your guests. What’s the best day and time to have a show? In my experience, Friday and Saturday evenings are the best days to have performances. Sundays are only a good option on holiday weekends, when your guests do not have to leave until Monday. Shows at 6:30PM, 7:00PM, and 7:30PM are generally the most well-attended. If most of your campers are ‘seasonal,’ (Meaning they keep their units year-round and come up at-will throughout the season) mid-week days like Wednesday and Thursday are great options as well. A tip: Advertise the show to start at a specific time, but actually start the program 10 minutes past that time. Campers are notoriously relaxed, and show up or leave their sites right at the advertised start time! While I am totally flexible and welcome late arrivals, I want to make sure as many of your guests are in the venue as possible so no one misses the fun!